These aren't your regular denim jeans. Sure, they look like regular jeans on the outside but using a new fabric we have created a pair of riding jeans that do not need bulky liners to keep you protected and offer you more protection and comfort than you were expecting. Single-layer design for increased comfort and maximum protection. Fabric made with 13.5oz cotton, Cordura® Nylon, and DuPont™ Kevlar® blend fabric eliminates the need for added liners. 150% - 350% more tensile strength than standard cotton denim. 125% - 200% higher tear strength than standard cotton denim. Estimated 500% increased abrasion resistance than standard cotton denim. Assembled using high strength 3-ply tec-75 nylon thread. Triple over-lock safety stitched critical seams and added internal safety stitching. Button closure and YKK® zipper. 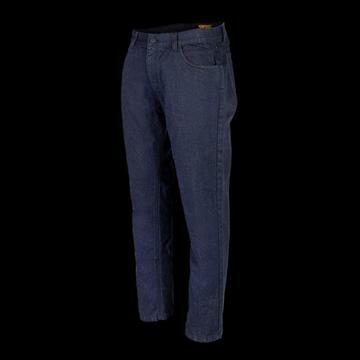 Available SAS-TEC® knee and hip armor for "The Primary" jeans available here.